In 2017, the vast potential of Camila Martins Pereira started to rain down in irresistible Orlando Pride purple. The number nine they adore down in O-Town is back to resume the show in 2019, and through no scarcity of joy or pain since her American adventure began, she has grown more than any pre-season assessment could ever show. Infectious energy assured, National Women’s Soccer League (NWSL) spectators came to learn two years ago that a Camila performance also comes with a risk of stunning strikes, and an occasional dose of outrageous nutmeg. In her debut year with Orlando Pride, head coach at the time Tom Sermanni’s pre-season projection that they would see a dynamic and versatile player packed with skill and potential proved as accurate as the Brazilian’s Goal of the Week-winning rocket down in Houston in week nine. Signed with her adeptness at full-back in mind, it would not be long before she found her way to the beating heart of the team’s creativity, with four goals and five assists coming from a player who featured in every regular season game. Last summer, she made her long-awaited return to action following ACL heartbreak in the final match before the 2017 play-offs. Having to go almost a full year without a competitive game, a player capable of bringing a crowd to its feet had felt the reset button pressed on her, with no quick way of reclaiming the independence she had been in tune with since leaving home at 13 to pursue a scholarship. She was to feel the warmest glow of friendship when, with her surgery set for the following day, she was thrown a surprise 23rd birthday party by the entire Pride squad, washing away the trepidation, if just for that day. It was fellow Brazilian international Mônica, the vastly experienced defender who recently departed the club, taking centre-stage, as she sang and played guitar. In fact, music is an all-round essential at the Pride, as Camila describes. “So in Orlando, Chi, our attacker, Chi Ubogagu, she usually puts the songs on; sometimes it was Mônica, but usually Chi is the one. There are times that Toni (Pressley), our defender, also chooses the songs. Soccer is the world’s game, yet there are many players around the world who, for any number of personal reasons, spend their career exclusively in their native country. For others, the sport is their vehicle to surging headlong into the unfamiliar; foreign languages, cultures and footballing ideals. While it is often said that the field is where footballers can be free to express themselves, not being able to converse comfortably, or at all, in the language of your new surroundings is like a glass box over the true picture of who you are. Last month, Camila was announced as one of five players to sign a new contract with Orlando. Assistant GM Erik Ustruck revealed the former Houston Dash player – surprisingly, in hindsight, waived by Houston in January 2016 – is now in the process of obtaining a Green Card. A smile has gone along with pretty much all she has done in Orlando, though she explains how she has been trying to cast aside the cocoon around her. “Learning English, in the first year it was complicated, because I was quieter. I was still settling, so I was pretty shy. A fundamental to know about Camila is the value she places on family. The 24-year-old started playing soccer at school because of her father, Edson Luiz Pereira, and he was also the one to introduce her to music. She thinks back to the first album she ever had, with a Brazilian duo bringing country to Camilinha! “Wow, when I was younger, I got it from my father, so I really liked it. He listened to it and so I ended up hearing it a lot. Being able to take songs and albums with you that are stitched into your memories of home means a great deal. Carrying thousands of them with you around the world is admittedly a little easier digitally than with vinyl, cassette tapes and CDs. Brazil can certainly be considered a nation where music is a way of life, with samba and bossa nova, as well as sertanejo, funk, pop, rock and various other genres popular around the country. Camila shares some of the sounds in her collection. “There are several songs that I like, but currently, I like ‘Lençol Dobrado’ (by ANALAGA, João Gustavo & Murilo). From (the) pagode (genre), I like ‘Pé na Areia’ by Thiaguinho, and one song I’m hearing a lot is from Isadora Pompeo – it’s about Jesus. During their time as club teammates, Camila has been taken under the wing of compatriot Marta, six times named the world’s best player. As with the aforementioned Mônica, it is a friendship which means Camila gets an ultra-exclusive concert ticket without even knowing, thanks to the forward’s habit of an impromptu guitar performance. 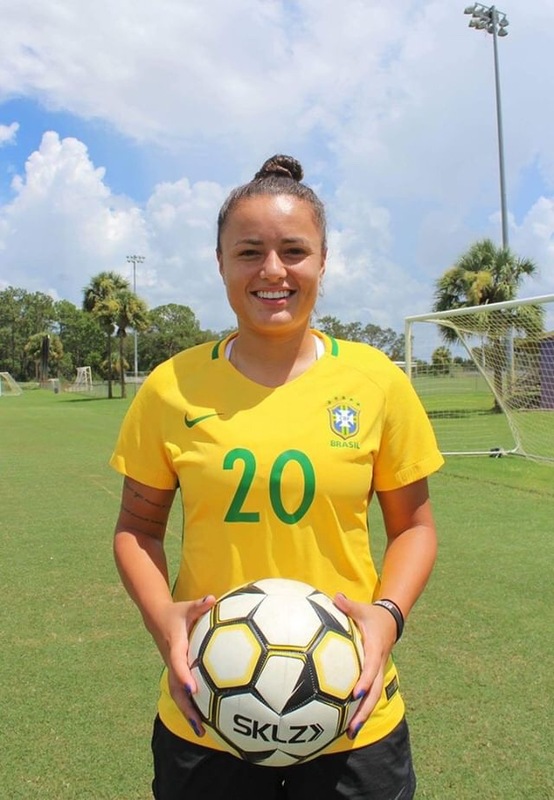 During the recent NWSL off-season, Camila was part of an ensemble making plenty of noise themselves, as her loan club Iranduba took third place as Copa Libertadores debutants. Portland Thorns midfielder Andressinha was a teammate during that spell with the Brazilian side, and back home is where Camila’s live music experience played out. It came by way of a festival that takes place this year at the Estádio Nacional Mané Garrincha; the venue of that 2016 United States v Sweden Olympic quarter-final. “I’ve been to a music festival in Brazil and that’s VillaMix. Concerts, I’ve never been, but I want to go because even Marta said it is very interesting, which is very cool. Representing Brazil at the 2014 FIFA Under-20 World Cup in Canada, Camila likes to be surrounded by music with the national team. Just like at Orlando, you do not have to go far to feel that beat bubbling. “Cristiane, Andressa Alves, Andressinha sometimes puts her playlist on; usually it’s these girls who play the music with the national team. I think it’s super important. “I think you relax, you stay calm, time is passing and you’re singing. It relaxes you. “There are people who stay with their own headphones enjoying their music. I think it’s important, if you are listening alone to focus and feel better, or if you like to be listening with everyone else, dancing or singing. As a youngster, Camila was offered a scholarship to play soccer for a private school (Falcão Soccer School), which took her away from home. She would later start out in her career as a futsal player in Jaraguá do Sul. That futsal background was there to see in Orlando’s August 2017 game with Sky Blue, as she rolled her foot over the ball expertly under pressure, nutmegging one defender down by the right touchline. It came with a service Dani Weatherholt will always remember, as she bagged her first professional goal from Camila’s cutback. There is joy to be had from watching players with craft or pace that takes their team from heavy defensive pressure to the other end of the field in seconds, even if the finishing touch is often missing. The consistent end product is what starts to elevate players, however, and Camila has shown she has the capability to be that performer. The magic starts to happen when you can fill a line-up with players on the same creative wavelength; the ones who deal in steps ahead. For Camila, her Pride teammates include the likes of Alex Morgan and Sydney Leroux (pregnant but no less potent, perhaps…), but if she needed some co-stars to come to her assistance in the studio, which players from her career would she cover a song with? “I think it would be with Marta or Mônica. In Orlando, Mônica always played, and Marta always plays when I’m at her house. “They are two very different styles: Marta likes more sertanejo, more old songs, and Mônica likes international music, slower songs, you know? So, I do not know the song we would do. Camila credits her father for the belief he always had in her ability to reach the top level, as well as noting the support from her mother, brother and sister. The scapular necklace she wears symbolises faith but also family, and the latter is even tattooed upon her. Family, faith and futebol – but make no mistake, music is right in there, too. “Wow, I find it super important. I think there is a lot of music that you listen to, to relax, to have fun and such, but there is a lot of music that speaks to you. “Isadora Pompeo – in the earlier question you asked me – I listen to her songs very much and it touches me a lot. It touches me a lot because it talks about Jesus. “There are other songs of hers talking about a heavenly place and it’s super interesting. I think you have to understand the music; you have to understand the melody, what she wants to convey, what she wants to convey to you. It may only be two years since Camila exploded into life as a newcomer in ‘The City Beautiful,’ but she has been made to feel part of the furniture in Orlando, which is somewhat fitting considering where she comes from. “I’m from São Bento do Sul. We live near the Serra Dona Francisca (a scenic mountain road), so it’s a small town, and it’s a cold place. “It is also known as The Furniture Town (owing to its furniture and textile production). I always liked the city, despite being from a small town. “When you leave São Bento to live in a big city, and then you go back there, you feel some differences, but I really like it there. My parents like that place, and pretty much my whole family lives there, too. “We always like to be very close, to be together in the same place, whether it’s a big house or a small house. We always like being together and that’s what I miss the most; to be around them always, to have a barbecue and to get everyone together, talking, playing, laughing. At such times, and all the more so when a day has not gone as you wished, you can question why you are putting yourself through the hurt of being far from home. The hope is that the reason for it will soon come back into focus. 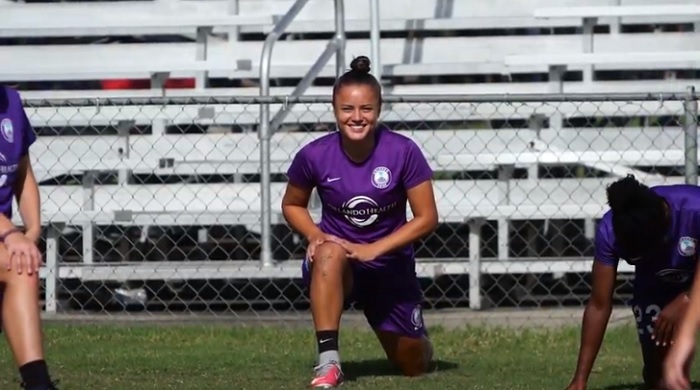 Although the pain of Camila’s knee injury cut deeper than any other setback she has faced in soccer, she has loved her time with the Pride so far, and it was a club that had her starry-eyed before she even joined, she says. She first took Goal of the Week honours in the 2017 season thanks to her effort at North Carolina Courage, as she drove at defenders before unleashing a right-footer into the far corner from the edge of the box. Then there was the sensational strike in a 4-2 win against her former club Houston Dash. A thunderbolt from deep outside the box, it left one of the game’s best keepers in Lydia Williams helpess as the Dash’s orange netting was rippled in world-class fashion. During the same year, she also showed she can sparkle at international level, with two goals on U.S. soil in the Tournament of Nations. In the 1-1 draw with Japan in Seattle, she was there to seize on a clearance and fire home a swerving effort, while in the humbling 6-1 loss to Australia at the StubHub Center, it was her who broke free in the box to sweep home the game’s opener. Having been ever-present in the Orlando team that came 3rd in the 2017 regular season, Camila came back to a rapturous reception when she was brought on in the 2-1 home win over Washington Spirit last July. She played nine times before the season was done and she is right in the mix at present as new coach Marc Skinner (recently arrived from Birmingham City) sets about improving on last year’s 7th place. The Englishman’s predecessor Tom Sermanni praised Camila’s focus and dedication during her injury rehab, a portion of which was undertaken in Brazil. She credits the example she has seen her teammates set in that regard, as she opens up on the extent to which her time in America has moulded the Camila we see today. “Wow, I learned a lot. The first time I went there was in 2015 (with Houston) and I think I grew a lot. “I had never left Brazil and I ended up living with a family in 2015, which was very important. I think I’ve met different cultures, different people, different ideas. “We have this in Brazil, but their way of thinking is very different from some of ours in Brazil. I ended up sharing an apartment with Mônica in Orlando. “You end up learning, you have to do all your stuff; not that I did not do that before, I did, but there you have to live your life. You do not have anyone to turn to, you have to work it out for yourself, you have to go it alone, you have to live that moment. “I think I grew a lot with this, and professionally, mostly. The girls are very disciplined, and with this area, I think I’ve grown a lot. As she says, she has learned to back herself to go it alone – like when she attacks with instinct, feeling and adventure – but there remains shelter and support beside her if she needs. 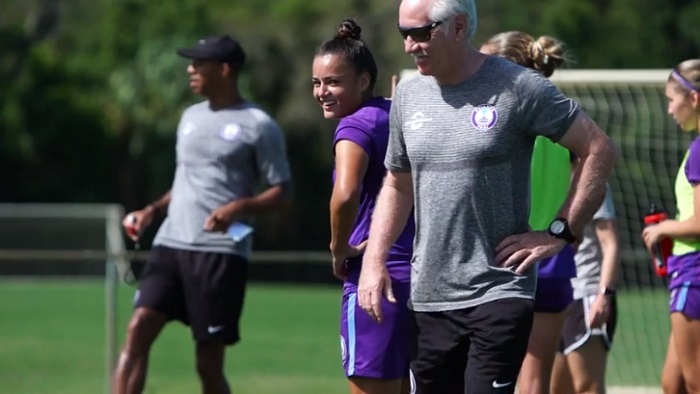 The Pride shared a ‘training cam’ video piece of her during that first season at the club, which included an attempt to catch Tom Sermanni off-guard with a nutmeg; she narrowly failed but it drew a smile from the sage Scot. Those around her will hope that playful spark never goes away. Music can be a deftly effective language tutor in its own right, and TV shows have a big part to play too in gradually adding layers of familiarity. There is one that comes to mind for Camila, even if the name is not quite at the tip of the tongue. “I have a show that I ended up watching because Toni (Pressley) was telling me about it. It’s a show that is popular in the United States, that has a single woman. “I forgot the name, but there are ten or 15 men interested in her, who present themselves, and each programme, a participant leaves until she chooses the man she will be with. So I ended up seeing this programme more. So maybe not ‘The Bachelorette,’ but have there been any English words or phrases she has found herself saying often? In a FIFA Women’s World Cup year, and with the NWSL’s seventh season underway in a fortnight, it is a case of stay tuned to see what comes next from the artist known as Camilinha. Raring to resume the show for club and country, she first gets to slip into the role of player-coach here for the regular final scenario of these interviews. It is a small-sided game she is asked to imagine, with Camila lining up against a team of five players. She needs four teammates of her own for this little match-up, and the only selection rule is that she has to have played alongside them at some point in her career. Other than that, she can base her line-up on any reasons she wishes. Here is the final run-down from Camila. “Ah, I would play Marta (forward), because she has a lot of will, she has a lot of speed, she has a lot of determination in the things she wants to do, and she hates to lose. I would have Andressa (Andressinha) (midfielder), because she is a person who thinks a lot in the middle of the field and she puts some incredible balls in for our attackers. “I think she’s a girl who thinks a lot, and she’s very young; she’s a year younger than me. She’s an excellent midfielder and I admire her a lot. “Defender…I would put Rafaelle, our defender Rafa. I would put her because today, I see her as one of the best defenders. “She plays very well, she is not afraid, she is strong. She’s really good. “For the goalie, I would put Letícia Izidoro, who is a girl that is my age. She just has a goalkeeper profile, and since I saw her for our Under-20s, in the World Cup we had in Canada, I became a fan of her. “I think she has a lot to grow, a lot to evolve, and we’ll hear a lot more about her. I spoke of four Brazilians because they are always with me and they are four Brazilians that I admire.